Features – For Shippers - Saloodo! do I add a transport request? does Saloodo! verify the carriers? do I get notified when I get new offers? do I track my shipment? To benefit from all the features listed below, you will first need to register as a company. The VAT ID is optional to create an account but mandatory if you want to use the main platform functions, such as posting transport requests, getting offers or simply to track & trace. For the latest product updates, new features or promotions, you should subscribe to our newsletter. Register your company for free and use your Saloodo! account whenever you want. With immediate access from any type of device (ex: mobile phone, laptop or tablet) you can log in to post transport requests, receive offers and get real-time status updates from the comfort of your office or while you are on the move. Turn your workspace into your personal digital assistant. With Saloodo!, the heavily paper-based administration is a thing of the past. Access documents such as proof of delivery or invoices directly in your dashboard within seconds. Download the documents you need at any time – it is as simple as that. The safety and security of your shipment is our top priority. More than 6000 carriers are currently registered on Saloodo!. Every carrier is thoroughly checked according to DHL’s Code of Conduct before any offers are submitted on the platform. We ensure quality and reliability throughout the entire transport process. Our team does its best to ensure a smooth transport process. From pick-up to delivery, we make sure to keep in contact with the carrier who transports your shipment. You can always follow-up in case you need additional status updates. With Saloodo! as a contract partner, no questions remain unanswered. We understand the importance of safety when it comes to transporting goods and we take responsibility for the security of your shipment. This is why you can contact us for any operational and administrative matters. We understand some questions can be answered more easily over the phone. This is why our customer service is available by telephone to assist you with any queries you may have. We want to improve your experience and support you in the best possible way every day. Call us and we will answer your questions. In the Saloodo! dashboard, you get an instant overview of your transport requests and completed orders. You can post transport requests, choose offers depending on your preferences, track your shipment and download transport documents. Simply enter your transport request using our smart shipment wizard. Enter the exact details of your shipment, such as size, weight, height, quantity, as well as the place of pick-up and delivery – post your request and get transport offers from verified carriers. In a fast-paced, ever-changing and complex industry, we made it simple, fast and easy for you to tell us what you want to transport. From a single pallet to a full truckload, our smart shipment wizard helps you describe and share your transport request with our network of verified carriers within a few minutes. Let’s assume you have recurring transport orders that have to be transported to the same address. With the new address book function, you don’t have to reinsert the address of the recipient and the sender every time, as you can select from the list of all previously stored contacts. We understand how important it is for you to be notified in a timely manner. This is why the low-capacity alert allows us to inform you in advance when there may be fewer offers for your transport request on low-traffic routes. As a result, we use real-time data to always try and find available transport companies for you. Once your transport request has been posted on the platform, the carriers will start to submit offers from which you can choose. The number of offers will depend on the locations selected and truck capacities. If your pick-up & delivery locations and dates are an exact match with the routes selected by the carrier, you will also be able to book an instant offer. The Saloodo! dashboard gives you direct access to all of the requests you posted on the platform as well as to the current status of your transports. You can track the progress of each transport order, from awaiting driver assignment to pick-up & delivery. Invite your colleagues to join you and work together so you can always be on top of your business operations. This way you can synchronise your transport requests with anyone in the company. Use this function for free and create your own workflow. You will receive transport offers from various carriers over a time period of three hours once the transport request has been posted on the platform. If you are not satisfied with any of the offers provided in this timeframe, you have the option to reactivate your transport request after the expiry of the initial validity period. We will show you a price estimation for your transport request before you book. The price indication helps you to easily compare the incoming transport offers. This way you can be sure that you are paying the best price for your transport. Whether you want to check again how high or low the price was for a previous transport request or on which date an invoice was uploaded for a transport order, you can always access the ”Archive” function (displayed in the drop-down menu). 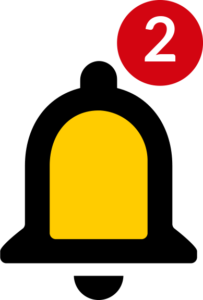 This way, you will always have an overview of your previous transport orders. 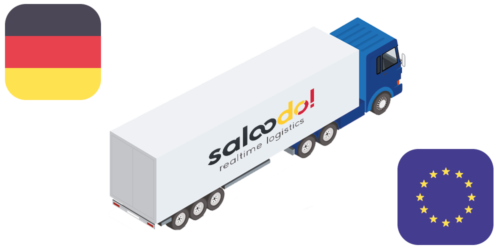 Simplify your transport tasks with Saloodo!. Our aim is to make your daily operations as simple as possible. This means you get to decide if you want to work with one of your favorite carriers or decide what type of payment your company prefers. With Saloodo!, you have the flexibility to choose from different payment methods. You can decide what is more convenient for your company. Whether you are a Paypal user or prefer to pay in instalments, you can always select what works best. We will pro-actively send real-time status updates and inform you on your shipment status at every step. Do you need additional information that goes beyond the track & trace function? Our customer service team will assist you throughout the entire transport process. Are you already in contact with your carriers and wish you could assign transport requests to them? Then simply invite them to our platform. As a thank you, we reward you with €100 in vouchers and your carrier with €50 when he signs up and books his first order. This way, both sides benefit. Activate your browser alerts to get notified directly when there is a new transport offer matching your request. 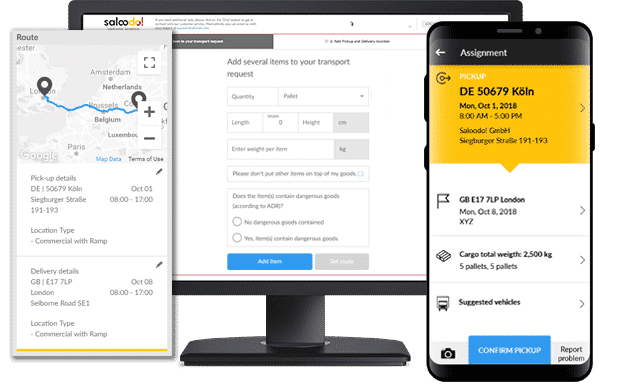 We will also send you emails when new transport documents have been added to your dashboard, so you can keep track of your shipment at any time. 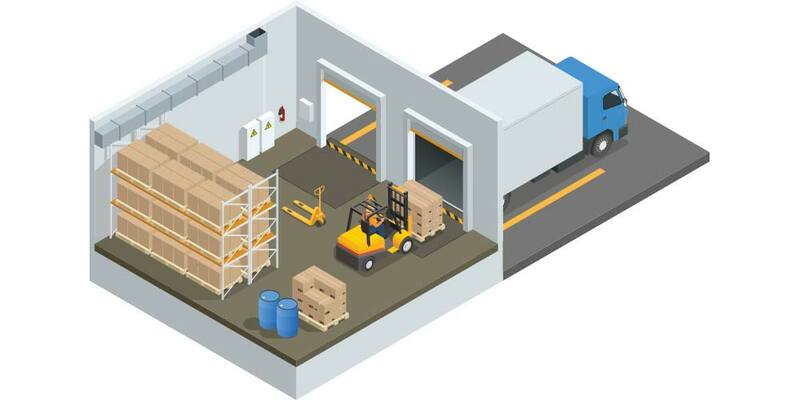 Do you want to confirm if your goods have been successfully delivered at the drop-off location or if the contact person assigned was on site? Just give us a call and we will provide any details you need. Stay informed about your current transport processes. All you have to do is activate your browser notifications. We will contact you whenever you receive a new transport offer or when there are new status updates. 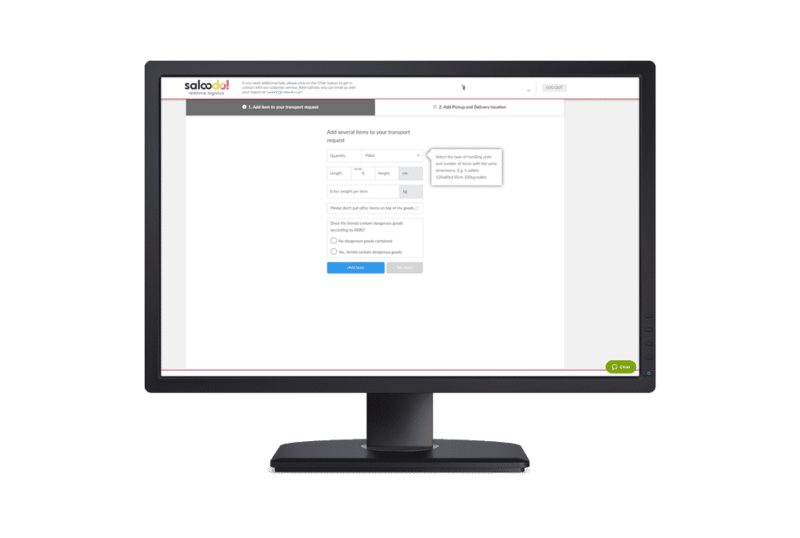 With Saloodo!, you are always informed about the current status of your shipment. You will receive real-time transport status updates to ensure on-time collection and delivery to the locations specified by you. We will notify you as soon as you receive new transport offers. With our dashboard notifications, you can see directly which offer matches your request and decide based on price or transport preferences. You will receive emails when new offers have been submitted for your transport requests or when documents have been added to your dashboard. This gives you the security and transparency you need to process your transport order correctly.